CHICAGO — With less than a month to go until Iowa’s first-in-the-nation Jan. 3 caucus vote–and the New Hampshire primary just five days later–a new poll suggests that women in the Hawkeye State are propelling Illinois Sen. Barack Obama to the head of the Democratic field and giving former Arkansas Gov. Mike Huckabee a strong push too. But many caucus voters are still undecided and Diane Bystrom, director of the Catt Center for Women and Politics at Iowa State University, cautions that the race remains unpredictable. This year’s primary schedule is more frontloaded and tightly packed than ever before, leaving candidates less time to rebound from an early loss and making the Iowa outcome that much more important. The nominations will almost certainly be decided after 23 states vote on Feb. 3, and could be determined well before that. Obama is listed as the Democratic leader for the first time–with 28 percent overall and 31 percent among women–in a Des Moines Register poll of likely caucus-goers released Dec. 1. After leading in all recent previous Iowa polls, New York Sen. Hillary Clinton follows with 25 percent overall and 26 percent among women. That’s a significant downshift for Clinton from the University of Iowa’s Hawkeye poll released Oct. 29, in which she led Democrats overall with about 29 percent, and Obama had 27 percent. 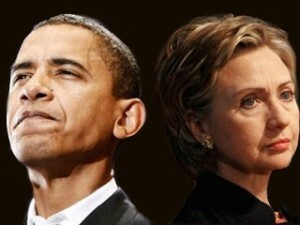 An Oct. 7 Register poll also showed Clinton at 29 percent, with Obama at 22. In the Oct. 29 poll, Clinton led Obama among women about 33 percent to 26. Former Sen. John Edwards had 20 percent overall, 17 among women. The change in the numbers over the past month suggests Obama’s newfound Iowa lead is being driven in part by a defection of women from the Clinton campaign. In the October poll, Clinton held a 7-percentage-point advantage among women, and is now 5 points behind Obama; a shift of 12 percentage points. The Obama campaign is currently looking to cement that lead, including new ads and speeches aimed at women. Michelle Obama conducted conference calls with Iowa women last week, and longtime Obama supporter Oprah Winfrey will campaign in Iowa for him for the first time this weekend. If those efforts help Obama’s numbers hold until next month, that’s bad news for Clinton, as her campaign relies heavily on the support of women. She notes that John Kerry had a small gender gap in 2004, as did former Vice President Al Gore and then-Gov. George Bush in the 2000 election. With a small population–30th in the nation–Iowa is 51 percent female, 49 percent male. It is 93 percent Caucasian, with a median age of 38 and 61 percent living in urban areas. But caucus voters are not a cross-section. “They’re a small, older, well-read group of people. And that’s true for both parties,” says J. Ann Selzer, whose polling firm Selzer and Company conducts the Register poll. Women made up 54 percent of caucus voters in 2004, and according to an October Register poll, 52 percent of those who consider themselves “likely voters” this year are women, including 62 percent of Democrats. Among Republicans, men outnumber women 58 percent to 42 percent. In both parties, Iowa women voted more than their male counterparts by 7 percentage points in the 2004 general election. For the GOP in the Dec. 1 poll, Huckabee earned 29 percent overall compared to Mitt Romney’s 24, partly because Huckabee–who formerly trailed Romney in all categories–is now tied with the former Massachusetts governor among women. He leads Romney by 8 percentage points among men and has spent less than $400,000 in Iowa so far, compared to about $7 million for Romney. A month earlier, Romney had 29 percent of the vote in the same poll, with Huckabee at only 12 percent. Former New York City mayor Rudy Giuliani and former Sen. Fred Thompson have 13 and 9 percent of the overall vote, respectively, and get more of their support from men. Thompson has fallen from a second-place position, as he had 18 percent in October, shortly after he first entered the race. Among Democrats, meanwhile, the race is on for younger women. In 2004 some 22 million registered single women under 30 did not vote nationwide. But Iowa voters under 30, especially women, turned out in higher proportions in 2004 than they had anytime since the caucuses became important in 1972. Ramona Oliver, communications director of Washington-based EMILY’s List, says 80 percent of registered Democratic Iowa women didn’t vote in the 2004 caucuses. So EMILY’s List–which supports pro-choice Democratic women and endorsed Clinton the day she announced her campaign–is focused on turning out women. In an online poll, the organization gauged Clinton’s support among Iowa women, and their likelihood to caucus on a 1-to-10 scale. Because caucuses involve going to specific precincts and publicly registering support instead of typical secret-ballot polling, Oliver says unfamiliarity with the process was the main obstacle to voting given in the EMILY’s List poll. The group has launched a Web site at YouGoGirl.com to give women more information about the caucus process and is mailing material to women who have voted in general elections but didn’t caucus last time. Jeff Fleischer is a Chicago-based journalist. He has written regularly for publications such as Mother Jones, the Sydney Morning Herald, the Chicago Daily Herald, Mental Floss and Chicago magazine.